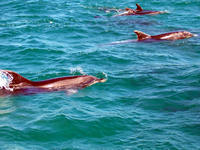 In an area bursting with interesting things to see the Dolphin Adventures tour out to spot and swim with dolphins is a fantastic journey. There are both morning and afternoon tours and the likelihood of seeing the beautiful creatures is almost guaranteed. The four-hour adventures begin at Paihia - with a pick-up at nearby Russell - and believe me if you get the right conditions you'll be in for an absolute treat. Our Fullers' crew of Tammy and the wonderfully named Floppy begin the trip by explaining about what you can and can't do and also how the sea conditions and make-up of any dolphin pods will determine whether or not you can swim with the creatures. It is illegal in New Zealand to get into the water with a dolphin pod that contains juveniles - both for the mammals' safety and your own. Dolphins are wonderful but a 200-kilo mother protecting her youngster from a perceived threat is not something I'd like to face. But the gals did say we would at least see them and so out we motored on a stable and comfortable jet-powered catamaran. Because the dolphins are wild their exact location varies depending on their whims and feeding patterns. 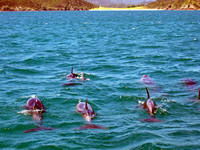 After about an hour of cruising the beautiful Bay of Island's coastline we were led to a super pod of about 40 dolphins. Normally there are about 15 in a pod so on the day we journeyed out we were very lucky. Floppy can recognise individual dolphins by their dorsal fins and any scars they may have and each sighting is noted down along with times, locations and weather conditions. 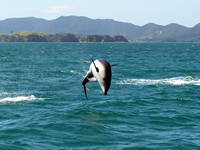 This is to build up a picture of dolphin behaviour in the Bay of Islands, although the highly mobile and unpredictable mammals will more than likely make a mockery of trying to pin them down through science. And it is one of the greatest joys of seeing dolphins in the wild. You are completely at their mercy and it all depends upon whether they feel like being sociable. On our trip the pod was keen to come to look at us and then once they'd worked out we were pretty cool looking guys and gals they performed and showed off. One hooked seaweed over its fin and began a game, while others sped by and around and leapt out of the water in a billow of spray that culminated in a whopping splash as it re-entered the blue of the bay. Amid oohs and aahs and clicking cameras we marvelled at their antics and I have to say this cynical journalist forgot all the garbage going on in the world and just took in the pure enjoyment of witnessing such wonderful creatures in their element. Pity I had to spend much of the time looking through my camera viewfinder but, hey, we hope you like the pictures. The super pod did have juveniles within its midst and so swimming with them was out, but I reckon there was no-one aboard the boat who was too disappointed because the spectacle was amazing. On the way back to Paihia we stopped in on Urupukapuka Island for a toilet stop and food and drinks at the local cafe. You can also take a quick dip in lovely Otehei Bay. 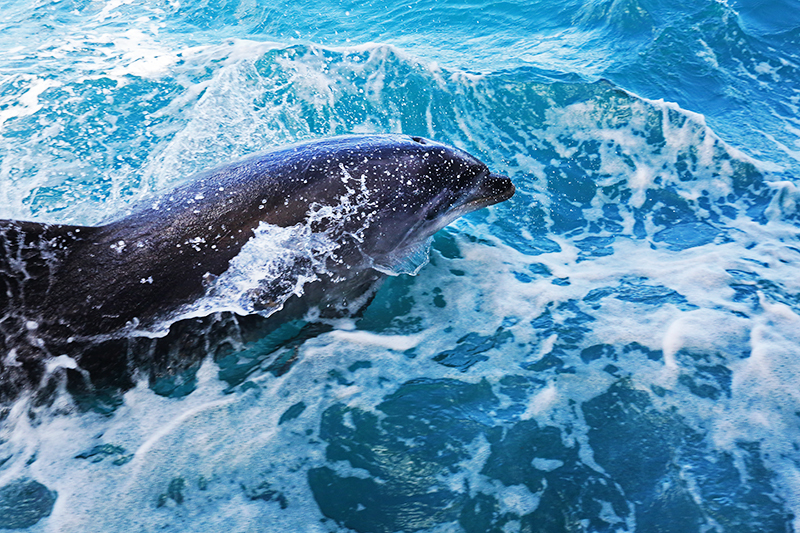 Fullers' Dolphin Adventures is a really well organised operation that mixes a terrific tour, with a professional, informative and really friendly service.